Stopping cat fights can be tricky business. How Big Do Bengal Cats Get? It sounds like you are on the right track by separating your cats and watching them closely. I would add another step or two to what you are already doing. I would separate the aggressive cat into her own area away from the rest of the household. Make sure she has plenty of food, water, and a fresh litter box. I would not switch the two cats out of this room, but would leave the aggressive cat in that room for about a week. You can go in and give her attention, but she does not come out of the room. After a week, place her into a crate and bring the crate into the main living area of your home. Leave her inside the crate for one hour and allow the older cat to sniff the cage. After an hour, open the door of the cage and allow the younger cat to come into the room. The instant there is any aggression from either cat, put the younger cat back into the crate and leave her there for an hour before releasing again. You may have to repeat this for weeks, putting the younger cat back into her isolated room after a few attempts at a time. I'm not sure why she suddenly became aggressive. 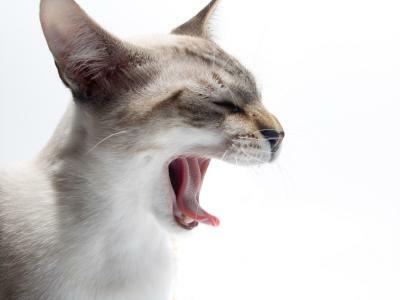 It is possible that your cat is feeling stress, because your family was away. Hopefully the cats will set back into their normal routine soon. I have a big problem that I hope you can help me with. My sister just passed away last week, and I agreed to take her cat "Prince" home to live with our family. He is very lovable and loves to talk, but he is very aggressive toward our other cats. I have brought other cats home as strays and didn't have any problems. The new cats were always kind of submissive, but not Prince. He is attacking my other cats that all get along with each other. I know at first there is always the hissing back and forth, but I never had trouble with the new cat attacking the cats that were already there. I have just started using the squirt gun, but I was wondering if there was anything else I could do if this doesn't work? I'm afraid it might change the behavior of my other cats that get along great with each other. He was my sister's cat, and I really want to keep him. My cats are all afraid of him, and my kids are afraid he might hurt our other cats. I will be going back to work, and I'm afraid there might be a big fight while I'm gone. I hope you can give me some advice. Thanks so much! I'm very sorry to hear about the loss of your sister. I completely understand why you want to give her cat a home and take care of him, and I think that with some patience and determination that you can work this situation out in a way that will keep all the cats happy and teach them to tolerate one another. First, limit Prince's space. Confine him with his litter box, water and cat food in a small space, such as a bathroom or laundry room. Each cat should also have a separate litter box. Go in and give him lots of attention, but let him live in this space for a week or two. This will do a couple of things. It will allow all the cats to get used to his presence and he to theirs, and it will teach him where his litter box is. When you are ready to bring him out of the smaller space, place him in a crate and bring him into the main living area. Leave him inside the crate for about an hour. Let the other cats check out the crate, sniff around it, hiss, meow, etc. After an hour, open the door of the crate and allow him to come out of his own free will. As he begins to interact with the other cats, watch him carefully. If he or they start any type of fight, put him immediately back in the crate and leave him for another hour. Then try letting him out again. Repeat this process as many times as necessary until the cats no longer fight. This takes a lot of patience, but it is worth the effort. It can sometimes take weeks of the crate method for particularly aggressive and stubborn cats. I hope that this works. I can tell that you really want to keep this cat in honor of your sister's memory. Please don't hesitate to come back if this doesn't work for any reason, and we will brainstorm some additional ideas. I'm hopeful it will work, though! I have two indoor cats: a one-year-old female and a seven-month-old male. Both have been spayed and neutered. The female constantly pins down the male and doesn't let go, even when he cries. He's a Siamese and very vocal. I try not to separate them so they can work it out on their own, but I can't stand to hear him cry. When I do separate them, he runs right back to her. Should I even bother separating them anymore, and why does he go right back to her? You're correct, Siamese are very vocal cats so your male may seem like he's making more of a fuss than he's truly feeling. Are you sure it is full blown fighting and not just play fighting? A true cat fight is usually marked by a lot of hissing and screaming from both cats. The fact that the male runs back to the female when you separate them would suggest she's not really causing serious pain. That said, it does seem like your female is feeling overly territorial. Since both cats have already been fixed, we'll need to consider some other options. You can safely break up their tussles by squirting the most aggressive cat in the face with a water bottle. This isn't harmful, but your cat will come to associate the unpleasant sensation with her biting, and it may cause her to give it up. You can also lessen the tension by giving them separate eating areas and litter boxes. I hesitate to suggest medication, but there is a drug called Clomipramine that can help mellow your female a bit. You would need to discuss your situation with your vet and see if he/she believes using medication is warranted. Ideally, using the drug for a short period might help your female change her behavior pattern, and then the medication could be discontinued. If none of these suggestions work, and you consider their spats serious enough to cause injury without your intervention, then you may need to decide whether you can keep both cats. Sometimes felines learn to work it out, other times a single cat is simply unable to accept another cat in its territory. Hi, I was directed to you with the hope that you can help with a problem I've been having for a while with my cats. I'm currently taking care of two male cats, an F3 Bengal who has a ton of curiosity, and a black cat who is very sweet and loving. I've been taking care of these cats for three months now. Needless to say, they're used to being around new cats, however, my own cat isn't. My own cat is a big white fluff ball that I've had for almost five years. She's never really been used to other cats because she's never been around them in all the years I've had her. She also never goes outside; she's very secluded, and doesn't take a liking to new company. My problem is, I want her to get used to the other cats. The boys tend to stay away from her, but they can't help but be curious. She'll often come outside and hang around with us, but if any of them come near her, she'll hiss, growl and even swipe at them. The sweet black cat now has a bloody nick on his ear because of her, and this tension from her has to stop. Is there any way to teach her to mellow out and become less bitter toward the others? At least to the point where she won't swipe at them if they happen to pass by? I'm sorry to hear that your feline companions are having difficulty getting along. Here's my point of view, for what it's worth. You can certainly discourage your own cat's aggression toward the cats you are pet sitting by giving her a squirt with a water bottle when she goes after them. However, you shouldn't expect such a mature cat to completely change her ways. She isn't ever likely to lay out the welcome mat, but you can hope for some tolerance at best. Remember, this has been her home and territory, and she is likely stressed out by the visitors. Her feelings must be taken into consideration. I wouldn't try to force the cats to get along, especially since the other cats will eventually go back home. Try to keep the males from pestering your female as much as possible and hopefully they can coexist peacefully enough in the remaining time they have to spend together.